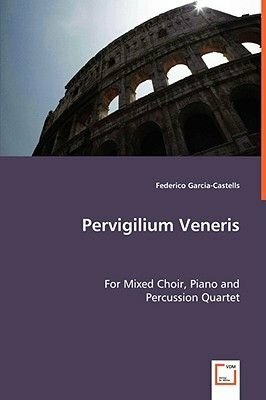 Pervigilium Veneris is a cantata composed after an anonymous poem from the third century. The rondo form is strongly related to the poem's structure which alternates a refrain with verses. In the introduction, the voices present the refrains and the first line of the verse using spoken rhythm accompanied with non-pitched percussion. The marimba introduces the element of pitch after the first refrain and the repetition of an A flat on the second line of the first verse is used as a transition from the non-pitched to the pitched material of the piece. On the following appearances of the refrain there is a melody line with an incremental increase of voices and instruments towards the end. On the verses single-pitched rhythmic phrases are alternated with modal melodies rotating the voices of the choir in groups. The dynamics of the piece move in blocks evoking ancient Roman architecture. Imprint: VDM Verlag Dr. Mueller E.K.